So I snuck off earlier and created the new page. There are some links in the ‘blogroll’, (in the sidebar on the Home page), but I suspect that they don’t always get discovered. Which is a shame because I reckon a lot of people would find them rather handy. So, to try and make them easier to find, I’ve created the page so that you can click on it from the main menu on the Home page of the blog. So far it’s a few main websites, but I will add to them over time as I find other helpful sites, (and as and when I steal a bit of time from the studies!). I only have so much working-brain-time so I don’t actually have that much of the day that I can study in, (which ramps up the pressure somewhat, and renders me pretty useless for the non-study hours, too). And the more I make my brain work, the harder it gets to convince it to work properly. So the new tactic is to study for an hour, tops, and then rest for two, or even three hours, doing simple stuff. It doesn’t allow me much time to get my studying done, and I’ve got a deadline looming in the not-too-distant future, so I’m dangling the carrots of tea and ‘Castleville’ (about all my brain seems to be up to in between study sprints!) to keep me plodding onwards! Don’t for a moment think that this studying lark is a drag, though. It’s not. I love it. It’s great to be doing something progressive for myself, of course, but it’s also phenomenally motivating to be studying with the aim of helping others and of broadening research knowledge available out there in the ether. It’s exciting to be making a mark that is useful, it’s thrilling to be using my brain and putting it to good use, and it’s a lovely feeling to get to write about things that I’m interested in. Structuring information, arguments and pointing out a big hole in the research ‘state of the art’ and then to getting the opportunity to trundle on in to attempt to shed some light on that gap in the knowledge base. Waffling much?! Yes, I absolutely love getting stuck into research that I really care about. But I’m going off on a happy little blog-writing tangent and ignoring the open book next to me with all those indecipherable notes in the margins looking at me and waiting for my attention once more. Aw, Magic Dude has brought me tea. I should stop writing so that I can recover for the next leg of the brain dance. Hope you’re all doing okay, much love and enthusiastic waffle from me! 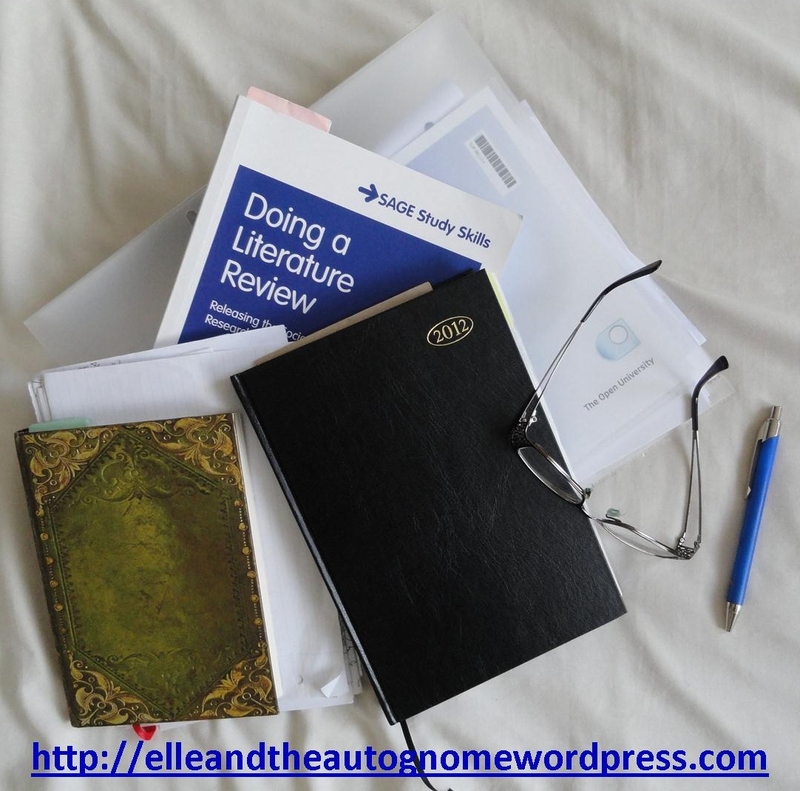 This entry was posted in Studying and tagged Brain Limitations, Dysautonomia, Education, Open University, Research, Student, Writing by Elle and the Auto Gnome. Bookmark the permalink.